78% of all women said they are attracted to a man that has one or more of these; what is it? 78% of all women said they are attracted to a man that has one or more scars...and good stories to go along with them! 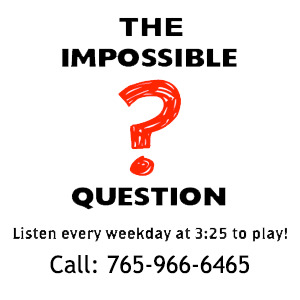 Congratulations to Charlene Mills of Fountain City, IN for being the first to correctly answer the Impossible Question!